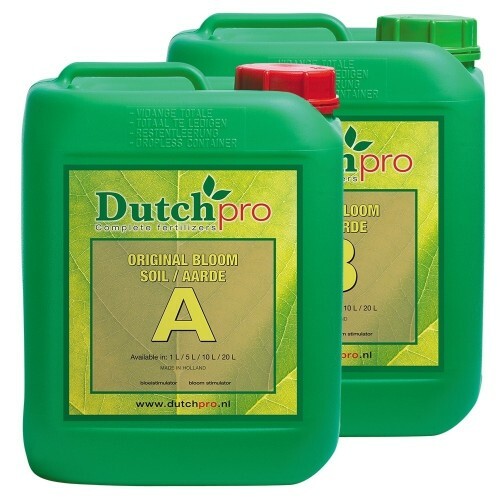 Dutch Pro Soil Bloom for soft water areas is one of the many nutrient rich products that Dutch Pro has created and is scientifically proven to cause extreme blooming of crops both herb and floral based. This nutrient rich mixture is powerful and balanced full of the much needed macro and micro nutrients to develop the largest and most lively blooms. Dutch Pro has been creating these nutrient rich products for over 30 years to all of Holland, but now these highly sought after products are used around the world by professional growers. Dutch Pro Soil Bloom is specifically developed for use in soil medium where soft water is used. Dutch Pro Soil Bloom has been specifically designed to work the best with auto flowering plants to generate the most wonderful, healthy and exuberant flowering. If you desire the ultimate in blooms and fruiting from you plants, then using Dutch Pro Soil Bloom for soft water will deliver. It develops stronger, healthier plants with macro and micro nutrients for the exuberant blooms.